Be a survivor NOT a statistic. 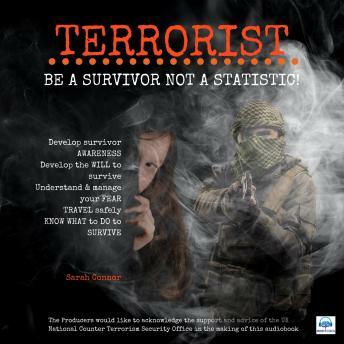 Outfox the terrorist predator by: Developing survivor AWARENESS, developing the WILL to survive, understanding and managing your FEAR, TRAVELLING safely, and experiencing POWERFUL attack scenario visualisations. In a world where every day brings news of a new terrorist atrocity whether in an airport, on a train or bus or at a night spot, theatre, restaurant, market place, or tourist attraction we must open our eyes and become aware of what is happening around us. Unfortunately these days if we are in public places we must be vigilant. In this audiobook we have brought together current thinking from around the world, from experts in Northern Ireland and GB and from Government departments in the UK, USA and some countries in Europe to help improve your chances if you are caught up in a terrorist firearms or weapons attack. This audiobook is designed to give you and your friends and family the skills and simple steps needed to improve your survival chances by outfoxing the predator: WHAT to DO to SURVIVE a terrorist firearms and weapons attack; how to develop survivor AWARENESS; how to develop the WILL to survive; how to understand and manage your FEAR; and how to TRAVEL safely. In helping you to learn and assimilate these new skills you will experience POWERFUL attack scenario visualisations with Sarah Connor walking by your side through a simulated attack and identifying each key learning point and action. We would like to acknowledge the support and advice of the UK National Counter Terrorism Security Office in the making of this audiobook.